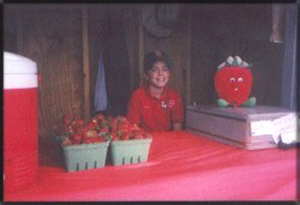 Welcome to McElwain's Strawberry Farm! 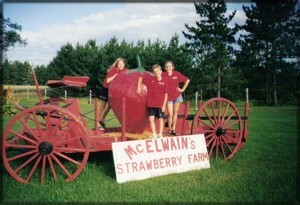 Located 3 miles from downtown Caribou on route 161 (beside the Caribou Country Club), McElwain's Strawberry Farm has been growing strawberries since 1985. The farm features pre-picked and U-pick strawberries which are generally sold from the end of June through most of July. A retired country schoolhouse serves as the farm's stand where a variety of vegetables including pumpkins, squash, cucumbers, sweet corn, string beans and tomatoes can be purchased when in season. 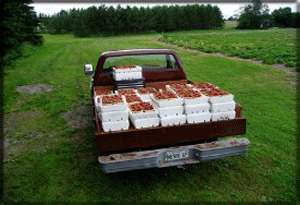 Pre-picked strawberries are sold at the farm in quart boxes. U-pick strawberries are sold by the pound. You may bring your own boxes or purchase boxes and/or picking flats in the field. You may also bring your own containers (bowls, pots, etc.) and we can weigh them before you fill them. Children are welcome! Giving your kids a chance to harvest their own food is a great family experience, and we've found that they learn to be really good pickers. They certainly are proud when their box is full! Please teach them to walk without stepping on the plants and how to pick "clean" (pick all of the ripe berries, not just the big ones). Check here, our facebook page, or call the farm (207) 498-8276 before coming to pick strawberries. Weather conditions and customer demand will affect availability. It is always good to call, check our message below (current picking status) or check our facebook page before coming.